Sorry for the delayed post. We took the red eye home from CA last night- and got home at 2:00 am. Remind me never to do that again! I’m planning on running a bunch of errands today, so I’ve opted for a really simple, yet comfy outfit (as usual). I’ve chosen my grey cords and a blue cable knit sweater. 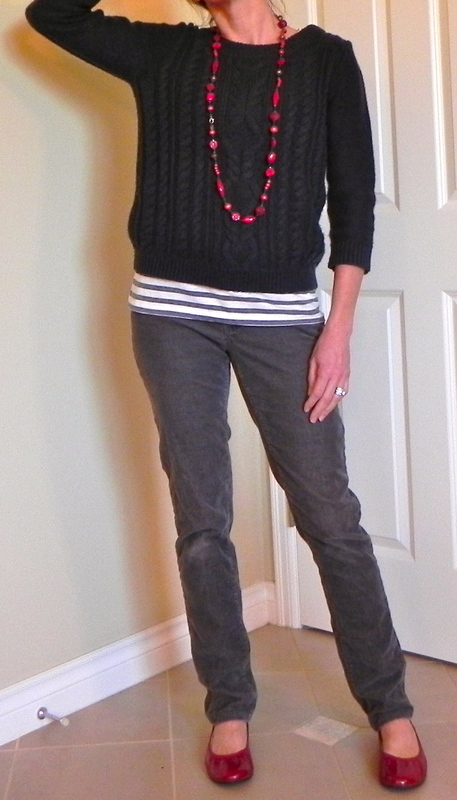 On the right the 2 together look rather blah- (especially in this bad lighting) but by simply adding a striped shirt under my sweater and then accessorizing with the red necklace and shoes- the outfit takes on a totally different look. I remember when I was younger and I thought the only thing you can wear under a sweater was a turtleneck. Preferably one with dolphins or rainbows (LOL! Just watch these will probably come back into style- I sincerely hope not). My point is- when these turtlenecks went out of style I didn’t know what to wear under sweaters. (I know, I told you I’m no fashion expert!). Luckily, I’ve learned that you can throw a sweater over a t shirt or a blouse and achieve a pretty cute look, if I do say so myself! 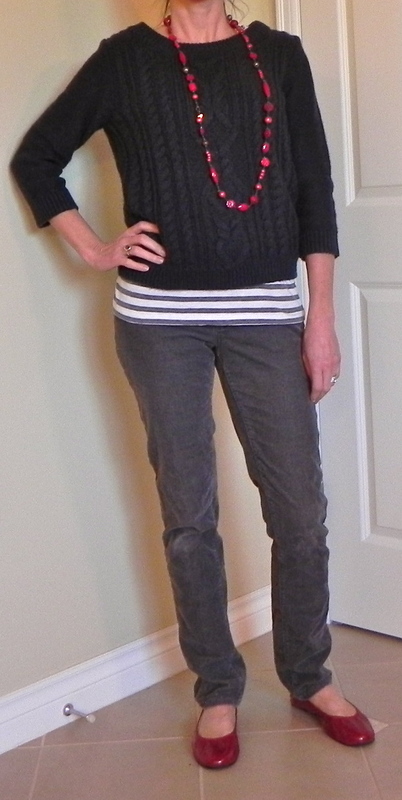 I’m linking with Fashion Friday with my friends at Girlymama today! Be sure to check them out too! Have a great weekend. I like how the stripes break up the solid colors. Feb 16th- Two Wrongs Make a Right? Feb 18th, What a Lovely Clavicle you Have! so cute. I love navy and red. I agree…the striped shirt looks nice and helps break up the color!